It's the space year 3500 and, by decree of the First, Great Star Emperor, all cubs receive mandatory brainwashing at facilities approved and run by the government. Cubs are required to attend sessions at these “Youth Centres” regularly in order to curb any rebellious thoughts and to keep them happy, willing and docile in temperament. Sessions are also used as opportunities to install post-hypnotic triggers and automatic behaviours in cubs which serve a number of socially beneficial purposes. In this society Milo and Pilou are members of the Imperial Cub Police; a force of well trained and especially deeply entranced cubs who ensure all other cubs stay just brainwashed and obedient as they are. As a reward for capturing the most rebels last month Milo and Pilou got to be the public face of the ICPF on this month's propaganda poster. Don't they look smart in their uniforms? Stop: Are you being a Good Boy right now? Cubs with disobedient or rebellious attitudes. Cubs who are modest or excessively shy. Cubs delinquent from conditioning sessions. 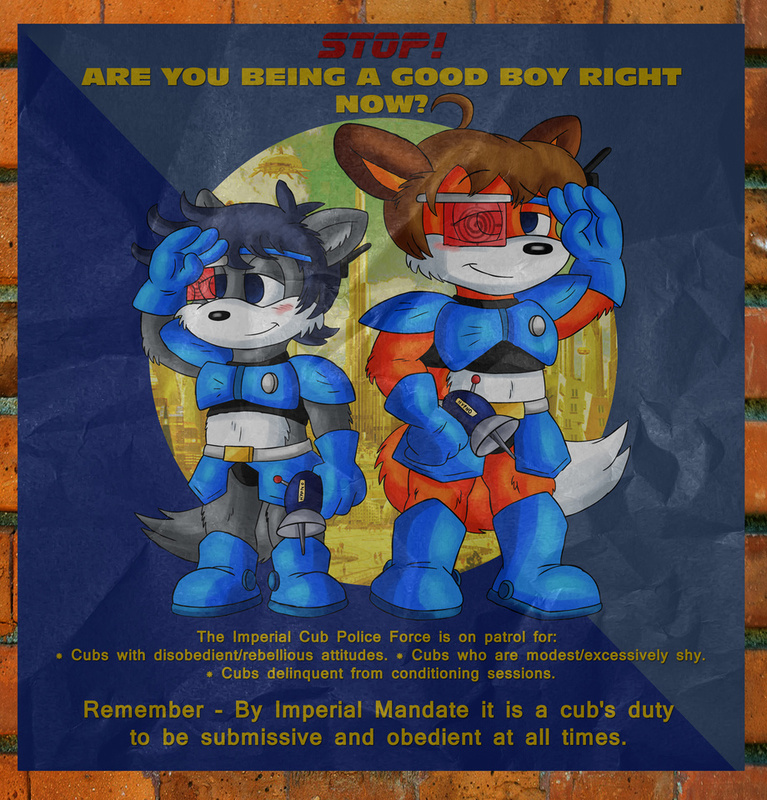 Remember: By Imperial Mandate it is a cub's duty to be submissive and obedient at all times. This is a picture I commissioned from HypnoFire86 who I'm really grateful to for doing both a complex costume and a detailed background on this one. Office Milo is the taller fox-boy on the right. Deputy Officer Pilou is the wolf on the left. basic condi.. comdi shioning? bu but what for? Why, to help you learn to become a good, upstanding, widdle member of society, instead of a naughty rebel like you are now. Won't that be nice? huh widdle member of society? wha u mean? how i rebelings? *Grabs you* Not wanting to be conditioned to be a good cub is grounds for being taken in for conditioning. *yips n squirms* wha ganna happin tas me? Well I know of one cub who has managed to avoid every conditioning so far. Perhaps because the little bat can fly. *tsk* There are only two classes of delinquent cubs in the Empire: (a) Those who the ICPF have already brought to the centres and are awaiting the next free education booth. And: (b) Those who the ICPF will soon be bringing in to the centres to await the next free education booth. Remember: it is your duty to the Empire to report any known delinquents or irregulars at the earliest practical opportunity. Good luck catching her, my duty of reporting, is done. Mmmm i wanna kiss their boots! Look for the cub who is shy about baring their midriff or wearing skin-tight clothing like school uniforms. There are lots of signs if you know what to be alert for. Cubs who are excessively shy are given extra lessons at their local youth centre to help them overcome their unhealthy modesty. In most cases it only takes a few treatments for them to be happy with the bodies they have, and that is usually all that is needed.